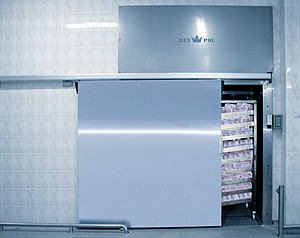 Defrosting chamber is a device for defrosting stage of meat and fish. Modern structure and wide offer of equipment allows for much faster defrosting of meat and fish with less work time consumed comparing to the traditional methods. Elimination of time-consuming activities results in higher effectiveness and lowering production cost. Simultaneously, uniformly defrosted products are obtained what positively affects further production. Defrosting in REX-POL chambers ensures quick and uniform defrosting for products packed in blocks, loose state and in cardboard boxes. Despite high defrosting rate the process leaves the plasma and does not tear the tissues of defrosted products. Defrosting in air - warming the frozen meat with the heat taken from the environment and heaters. The meat should be warmed with warming devices, can not exhibit strange smell and contaminations. Heat source is installed in a way that it does not radiate directly on the meat. This type of defrosting can be practically divided into two periods - slow defrosting and drying. Defrosting by spraying - warming the meat to the desired temperature with a heat provided by fluid environment, by spraying the frozen meat under a shower. For defrosting in fluid environment water is used. Water can be used in case of meat in any form (carcass, half carcass, elements) and with different processing designation. All both methods can be supported by direct low steam . It makes the process parameter and time better.